Today we present a delicious original dish which will be to present a different way of incoming salad: Cold tuna, anchovy and piquillo pepper stuffed tomatoes. The main ingredient of this dish, is a tomato Raf, but… Do you know what is and what benefits the tomato Raf? The Raf Tomato is a variety of tomato obtained from artificial selection of traditional tomatoes that are planted outdoors. Moreover, tomato stands out for its favor and texture, for that reason we chose them for our salad. The tomato content vitamins C and E and it is an important source of antioxidants. In addition, tomato is also very rich in vitamins, fiber and minerals. On the other hand, tuna and anchovies in oil, bring a good amount of Omega 3 fatty acids, they will help us to reduce blood cholesterol levels. Here we show our new recipe. 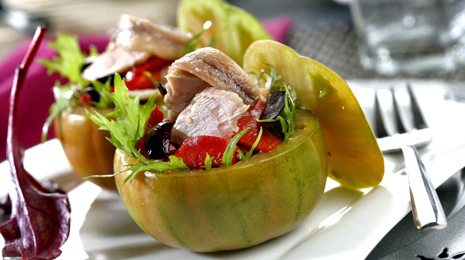 Cold tuna, anchovy and piquillo Pepper Stuffed Tomatoes. First you wash the tomatoes with abundant water. Then, you empty the tomatoes. To do this, you will need to cut the top of the tomato to be able to fill and empty the contents of the tomatoes with a spoon. Then you will have to chop that content and you put in a bowl. Then, we will put in that same bowl the split into small pieces and pitted black olives, anchovies, tuna and piquillo peppers, everything well chopped to eat as a salad. You must dress it with oil, vinegar and salt to your liking. Finally we will fill the tomato. To do this, you will put the leaves of arugula in the bottom, and then you will fill the rest of the tomato with the salad that we left in the bowl. And it would be ready! In just 10 minutes you will have an original dish, an entree, that will serve to present the salad in a different way. In addition, as we always look for in our Menuterrano App, it is a tasty dish, low calorie, refreshing and light. Mediterranean Diet, Mediterranean Recipes, Mediterranean Tips diet, health, healthy habits, healthy recipes, mediterranean diet, mediterranean recipes, wearable. permalink.